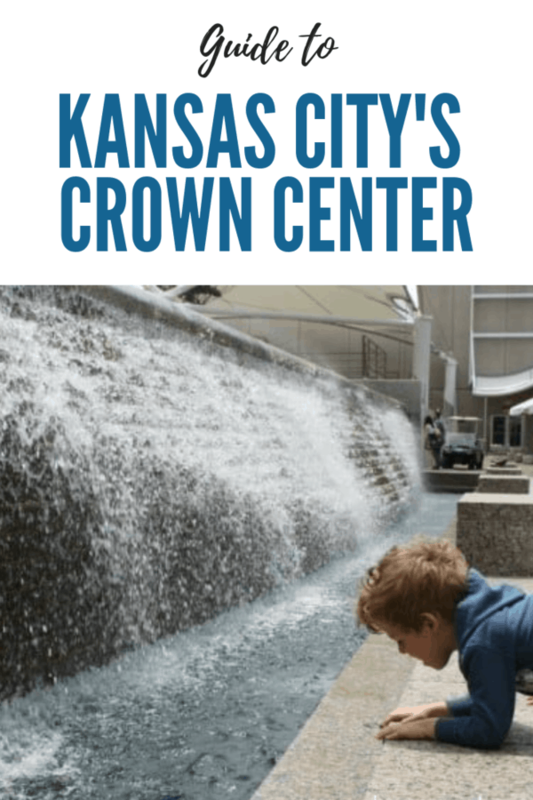 Kansas City’s Crown Center attracts visitors for a number of reasons: FREE activities, kid-friendly attractions, shops and restaurants. We’ve visited Crown Center several times and still have yet to see all there is – it’s really Crown Center District with a ton to do. My family’s most recent visit was during the holidays. The visit was hosted by Visit KC. My kids don’t know that they haven’t been to Legoland yet. 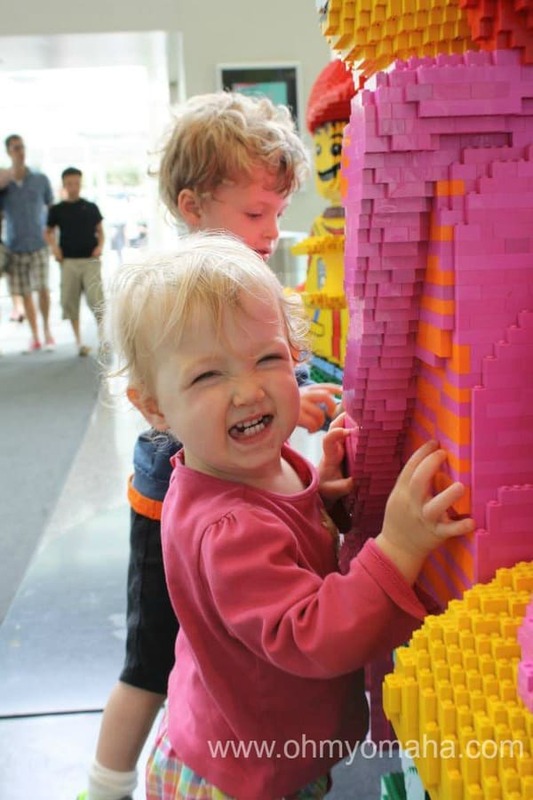 When they were little, these Lego sculptures near the food court in Crown Center sufficed. – The FREE Hallmark Visitors Center and Kaleidoscope, where children and their families create amazing art. – Musical Theater Heritage is a professional theater company staging American musicals. – Fountains. The kids loved all of the fountains at Crown Center, especially the ones you can play in when the weather’s warm enough (which, of course, I didn’t get a picture of). Checking out one of the fountains at Crown Center. There are more than 15 places to dine at Crown Center Shops. We’ve dined in the area on a couple visits. Winning for most unique concept is Fritz’s Railroad Restaurant – a model train delivers the meal to your table. It was a big hit with the kids. The menu includes hamburgers, sandwiches and fries. 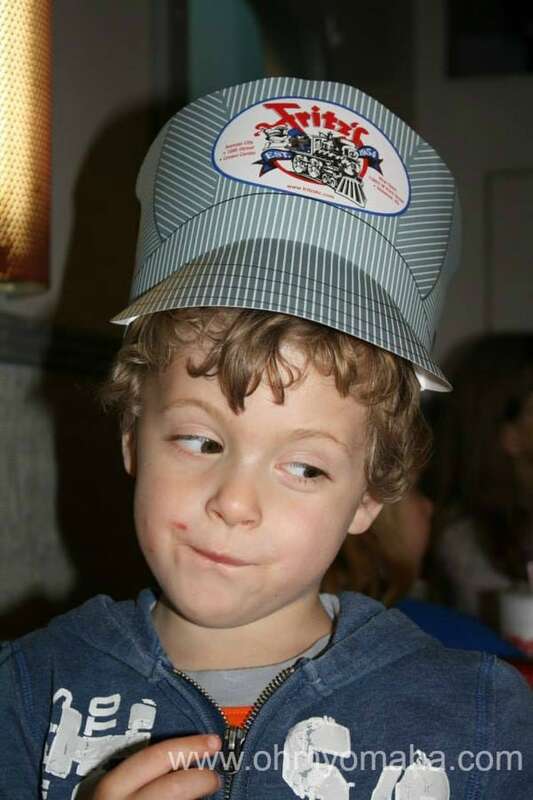 Farley ponders a fry at Fritz’s Railroad Restaurant while he wears his free conductor’s hat. We’ve also dined at Crayola Cafe and SPIN! Neapolitan Pizza. I’m still searching for one that pleases both the grownups and the kids, honestly. You kinda feel like you have to go to Fritz’s because of the novelty, but the other two would not be ones I’d send you guys to dine. Here are other places to buys grub at Crown Center: The American Restaurant (upscale), Chip’s Candy Factory (fudge), d’Bronx (deli & pizza), Einstein Bros. Bagels, Greek Food, Ltd., Juice Stop, K.C. Bar B.Q., Milano Italian Dining (casual Italian), Pak Ling Express (Chinese), Potatoes and More, Shang Tea Co., Sheridan’s Lattés & Frozen Custard, Smallcakes Cupcakery and Creamery, SPIN! Neapolitan Pizza, A Streetcar Named Desire (full service restaurant, has the streetcar), Taste of Philly, and Three Little Pigs BBQ. Christmas at Crown Center – In 2015, the shopping center used #ShineBrightKC on its social media channels – for good reason. This place sparkles! Hello, photo opps. 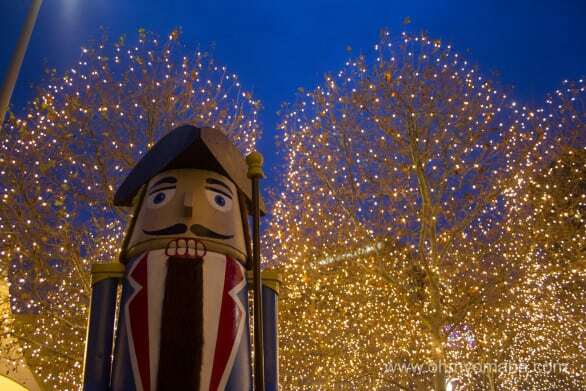 One of the many nutcrackers at Crown Center in downtown Kansas City, Missouri. Inside the shopping center, we stumbled upon carolers. We missed out on the “Charlie Brown Christmas play at The Corterie (sold out! ), as well as the gingerbread houses. The kids loved climbing on the over-sized wooden sculptures surrounding the mayor’s large Christmas tree. Due to unseasonably warm weather, we missed out on enjoying outdoor ice skating rink. We returned for a KC Christmas in 2017 and got to skate on the Ice Terrace, though, so all was forgiven. Play time at the base of the Mayor’s Tree at Crown Center in Kansas City. If you’re visiting Kansas City during the holidays, you should stop even if it’s just to take some pictures of the scene. 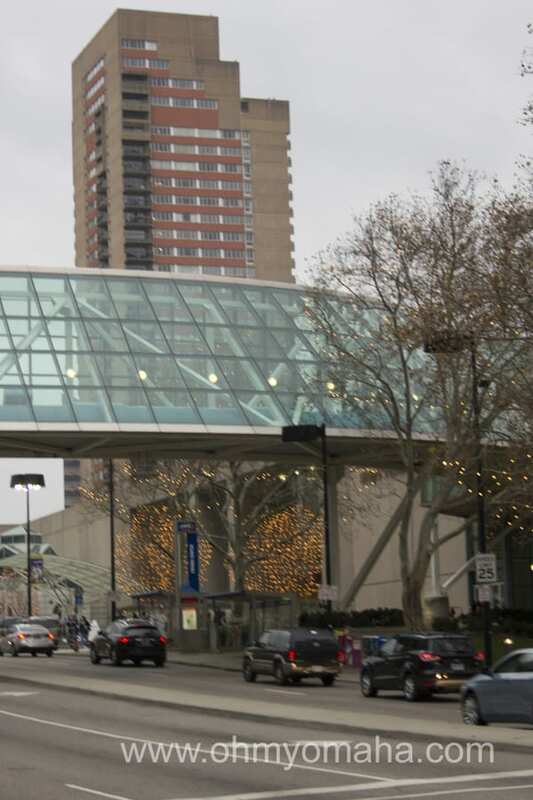 There are two hotels in the area, both connected to Crown Center by the Link, a covered walkway system over the streets: Sheraton and The Westin. Our hosted visit was at the Sheraton. What a perfect place to stay with a family in Kansas City! 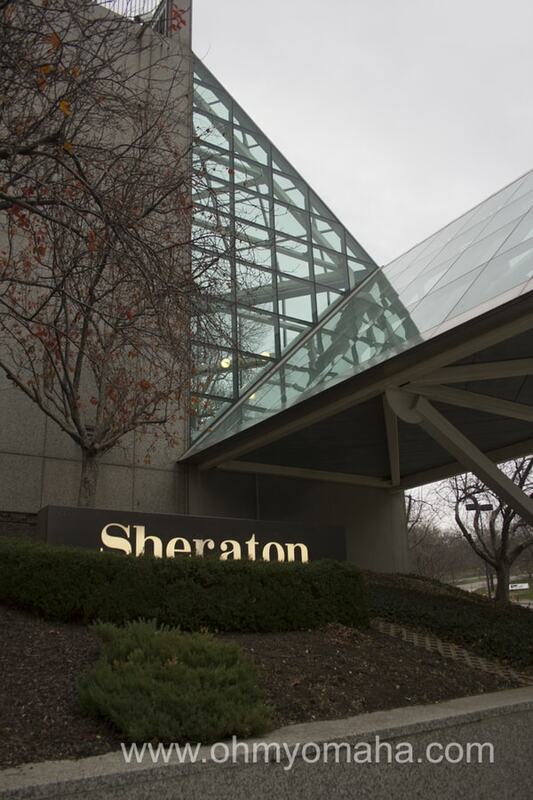 Sheraton Crown Center is an easy walk from Crown Center attractions thanks to the Link system over the streets. 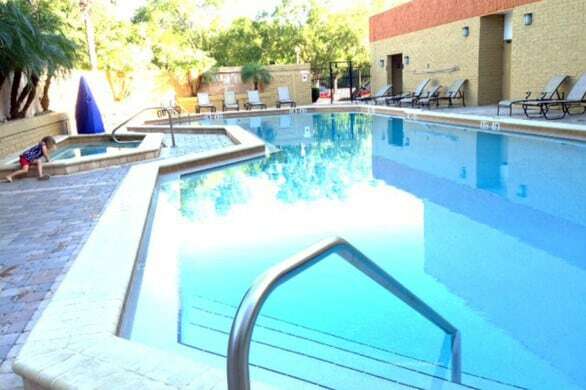 First off, any place with a rooftop pool heated year-round is a hit with my kids. My daughter still talks about it. The rooms are comfy and spacious, there are dining options inside the hotel and best of all, the Link system is darn handy in the winter. The Kansas City Link connects hotels and attractions, making it easy to park in one spot and walk to another. The Westin is even closer to the Crown Center action. You pass through the Westin if you’re using the Link system to get to Union Station. A bit further away, but closer to the Country Club (if that’s on your itinerary), is the Holiday Inn. 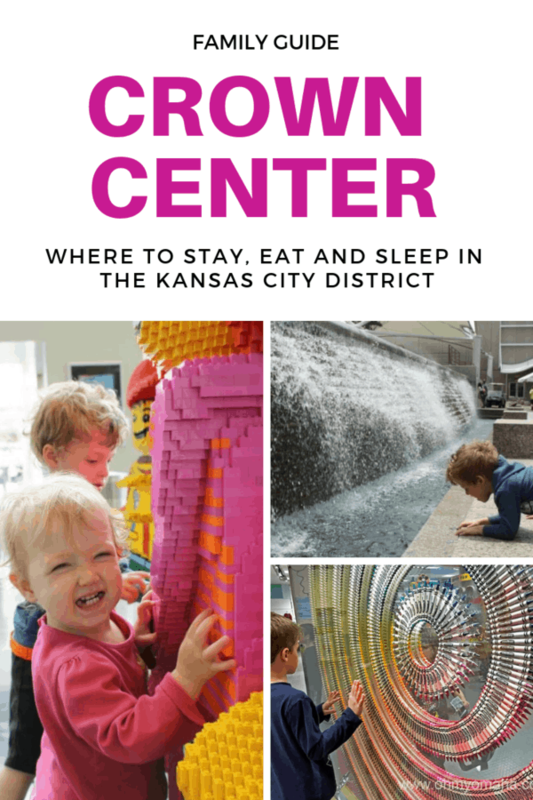 Beyond the shopping center area, you can find museums and attractions, including one of our new favorites, Union Station (take the kids to Science City!). Other things to see include, the National World War I Museum at Liberty Memorial – which has been highly recommended by several friends so it’s on my list to visit – and The Money Federal Reserve Museum (you receive a complimentary bag of shredded currency there as a souvenir – worth $165). Kansas City Irish Fest – Three days of all things Celtic – music, dancing and exhibits. WeekEnder – Friday nights in July and August, enjoy live music, outdoor movies, food trucks, artisans and more at Crown Center Square. 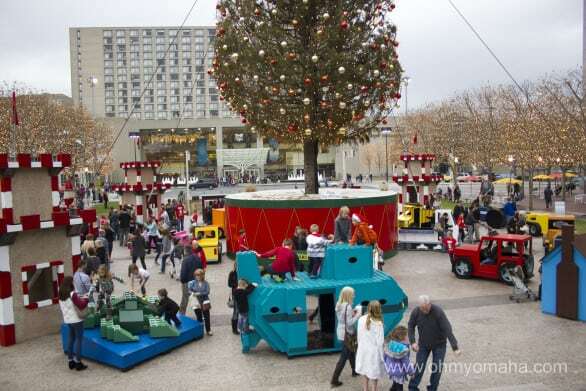 Other events – Antique Festival, Fiesta Kansas City and Hallmarket… and let’s not forget our favorite, Christmas at Crown Center with the Mayor’s Christmas Tree, Crayola Christmas Land and the Ice Terrace. Disclaimer: Our visit was hosted by Visit KC. All opinions expressed are my own. 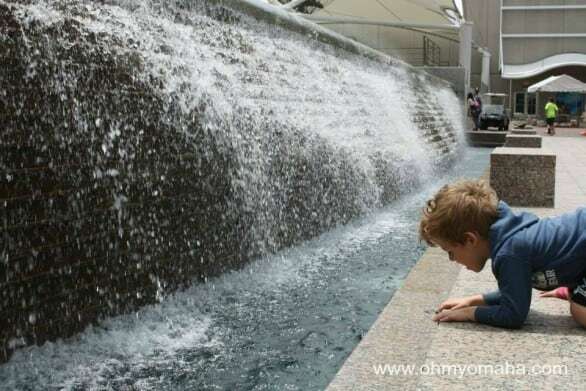 ** This post is part of the #wkendtravelinspiration link-up at FamiliesGo! 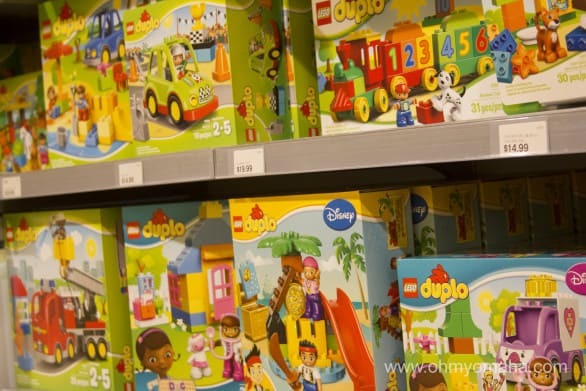 My love-hate relationship with LEGOs dates only a year or two back, when my son graduated to the teeny tiny LEGOs that cause maximum pain if you step on them. But, he loves building with them so he keeps getting more. And now my daughter is starting to dig the Duplo sets. 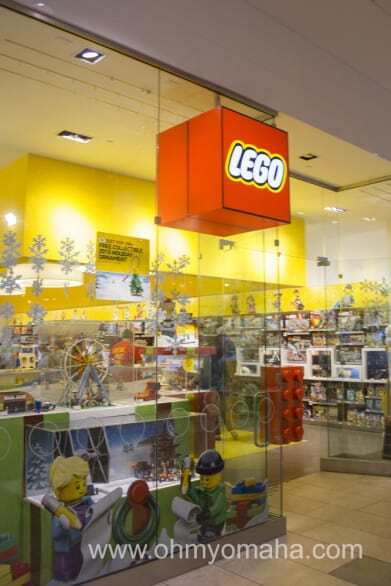 So, it’s only natural that we had to stop at the LEGO Store during our recent visit to Oak Park Mall in Overland Park, Kan. Just try walking past it with young kids. You can’t. It’s too inviting. And I swear it’s one of the first logos kids learn to spot. The Mecca for builders out there, the LEGO Store inside Oak Park Mall in Overland Park, Kan.
It’s heaven for the builders out there, any age, any ability. And any price point. Want to build the Millennium Falcon? $300 and it’s yours. Want a mini figurine? $5 bucks and change. 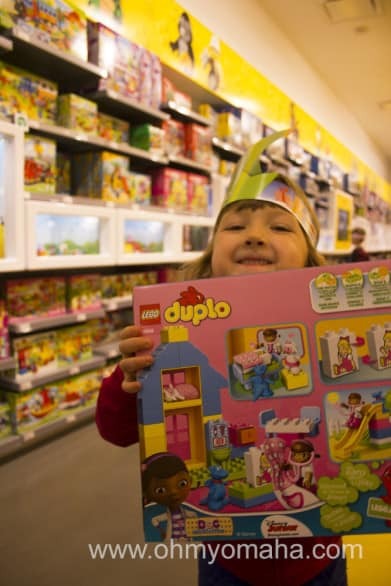 The store is divided into sections, with a small area for the preschool crowd. Building sets for the preschool crowd. My daughter’s stomping grounds. Other areas were more themed – think “Star Wars” and … I don’t know, my son wouldn’t look at any other area, so that’s the only one I really saw. 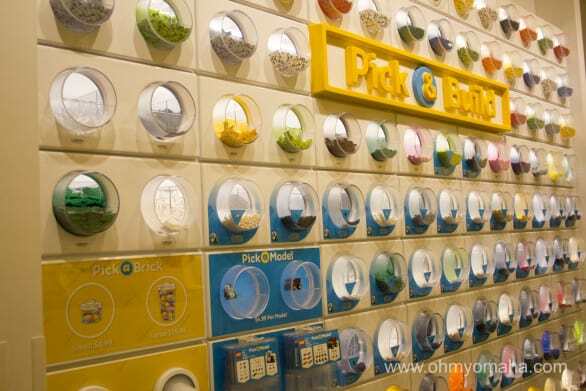 If you don’t want a whole new set, there’s a great big wall ‘o LEGOs that you can peruse to create your own mini-figures. For $4.99 (plus tax), you can gather the pieces for your very own creature in the Pick a Model experience. It might just be me not knowing price points, but it seemed cheaper buying sets at this LEGO store than at big box stores. FYI: The store has a digital screen where you can scan some special boxes for an interactive experience – you’ll see some of the sets come alive on screen. There are also store events you may want to join if you live in the area. Check out their website for more information. Where: Oak Park Mall, 11149 W. 95th St., No. 18A, Overland Park, Kan.
Disclaimer: Visit Overland Park hosted my family’s visit to Overland Park, Kan. All opinions expressed here are my own. We set out to Kansas City for a weekend getaway in December – three days to take in the lights, the holiday traditions and the barbecue. 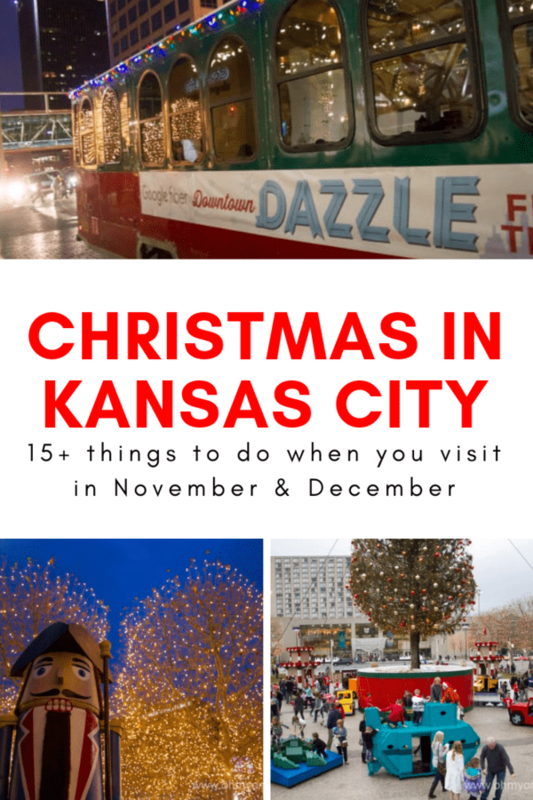 Today’s post is all holiday themed – there are so many things you could do during a KC Christmas getaway! I included some nearby cities that are close enough to Kansas City to include in planning outings. I’ve also updated this list with trips we’ve taken around the holidays since this post was originally written. Disclosure: Our visit was hosted by the fine folks at Visit KC and Visit Overland Park. All thoughts, opinions and typos are my own. This post may include affiliate links. At no additional cost to you, I receive a small payment for referring people who click the affiliate link. Kansas City has a ton of FREE things at Christmas time, which I’ll get to shortly, but like every other city, some things you have to pay for. Here’s one that’s totally worth it. WinterFest at Worlds of Fun runs Nov. 23 through Dec. 31, 2018. WinterFest at Worlds of Fun in Kansas City, Mo. 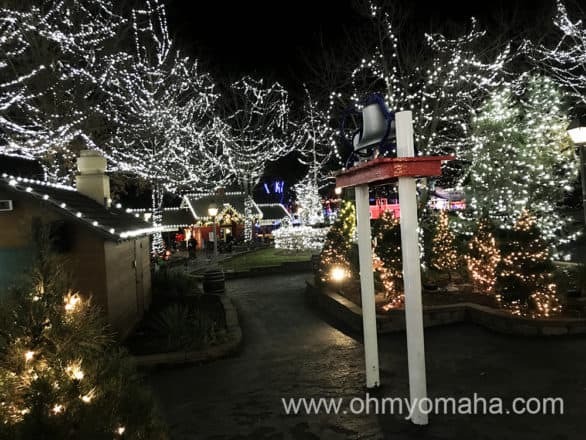 : Worlds of Fun started a new holiday tradition in 2017 called WinterFest. Think tons of lights, lots of music, snow, and most fun of all, rides. I shared some tips to make the most of your visit here. In 2018, WinterFest runs from Nov. 23 to Dec. 31. 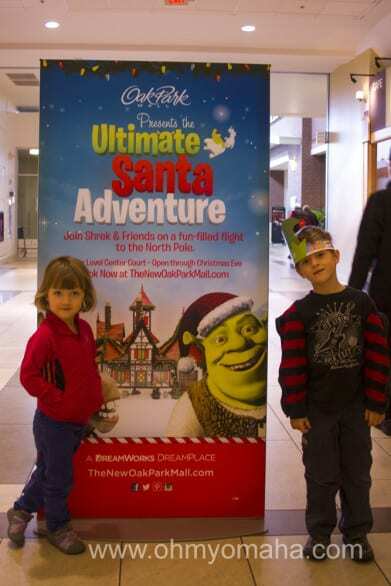 DreamWorks Ultimate Santa Experience features Shrek, Donkey and the big man himself. The walls off Dream Place can entertain kids for so long, you’ll think it’s a Christmas miracle. More Ticketed Christmas experiences in Kansas City, Mo. 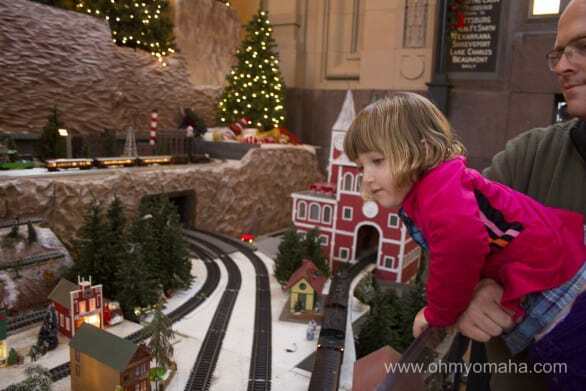 : Among some of the Union Station attractions that cost extra are the holiday classic movies at the Extreme Screen Theatre, holiday themed shows at the planetarium, with Laser Holiday Magic shows running Nov. 17, 2018 through Jan. 9, 2019, and holiday themed events at Science City, including Science City’s Noon Year’s on Dec. 31. Theater companies and performing arts venues also produce holiday shows this time of year. We could’ve also gone to the Kansas City Zoo to see Santa Dives with Penguins or Lions & Christmas Trees. 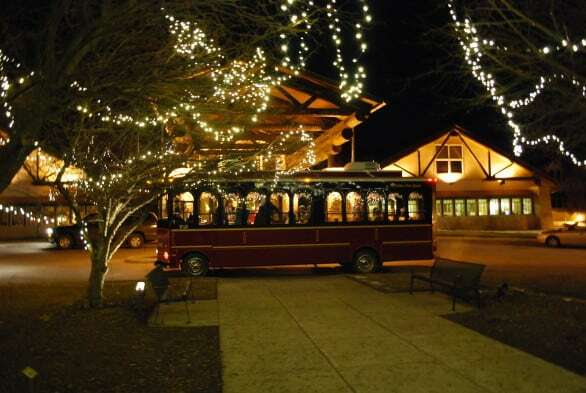 More Ticketed Christmas experiences in Overland Park, Kan.: Every year, the paths of the Overland Park Arboretum & Botanical Garden are candlelit for the Luminary Walk (held in late November/early December). 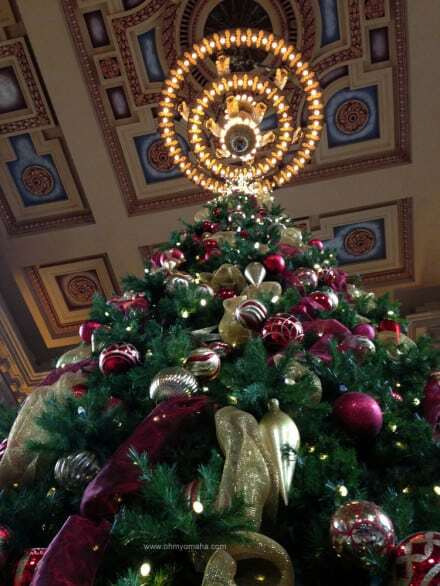 The grand lobby of Union Station would impress you any time of year, but add Christmas decorations and the sight is beautiful. Union Station in Kansas City, Mo. : This was our first time visiting the magnificent Union Station, and it was decked out at Christmas time during “Holidays Come Alive at Union Station.” You can visit several areas for free so come by to see the huge indoor tree and the Model Train Experience, an incredible room of miniature trains (800 feet of track and counting). Trains of all sizes are at Union Station in Kansas City. There’s even a mini train kids can ride, which travels through a Christmas-y scene. Crown Center in Kansas City, Mo. 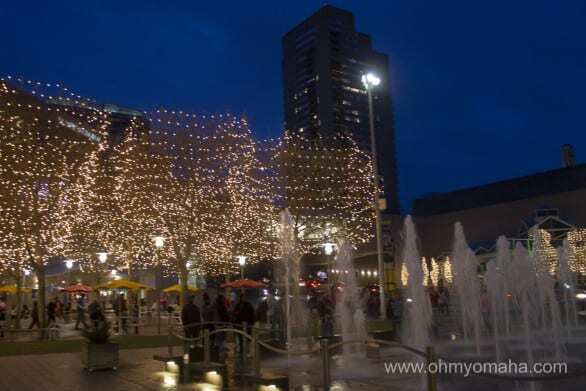 : Dazzling is the best way to describe Crown Center at Christmas time. At the center is the Mayor’s Christmas Tree. 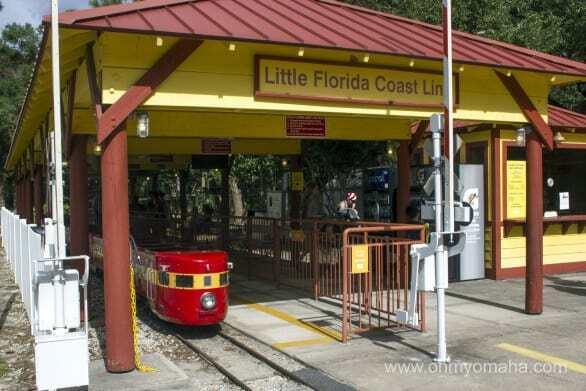 At its base is a play area of structures like cars, wagons and trains. The kids loved it. And since we were there when it was unseasonably warm, the fountains were on. The combined effect of a thousands of lights and a fountain was enchanting. Totally worth stopping by, even if you just go to get a picture. Photo No. 114 of the 132 pictures of the we took of the Crown Center lights, give or take. City Market in Kansas City, Mo. 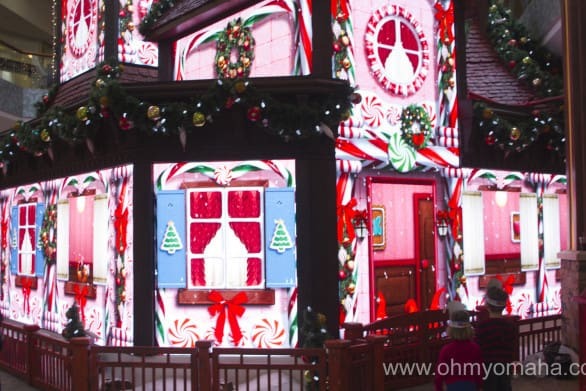 : Every year, the City Market opens a little Whoville attraction. It’s usually open on select weekends in December. Check the City Market calendar. The Oh My! 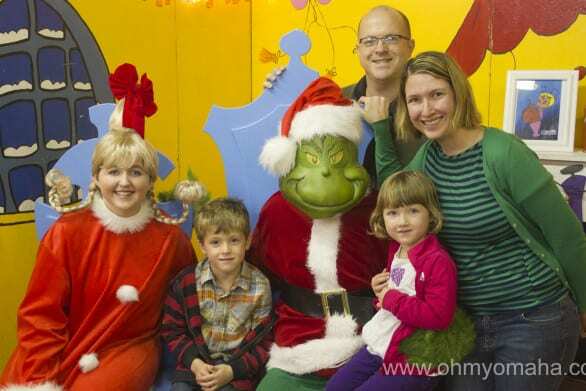 Omaha gang with Cindy Lou and the Grinch at City Market. 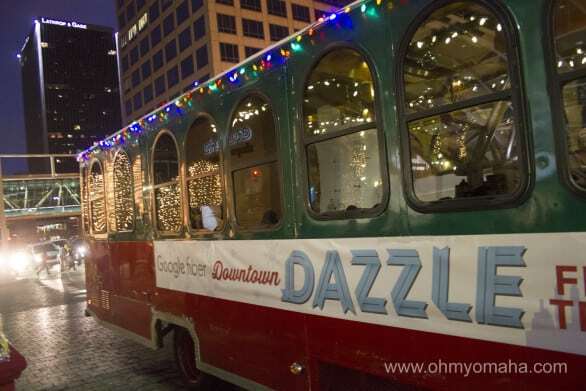 Who knew the Downtown Dazzle trolley ride would be one of my daughter’s favorite experiences of the entire trip (ranking up there with the hotel pool). The most Christmas-y Neighborhood in America – I dubbed it that, but all of Johnson County knows it as Christmas Place, the No. 1 neighborhood to see lights (23 homes on two cul-de-sacs). We stumbled upon it on our way back to our hotel. Find it at 131st Place and Antioch in Overland Park, Kan. Get the backstory here. We were lucky enough to stay at two different hotels during our visit, and both were ready for Christmas. You can book these hotels or find other family-friendly Kansas City area hotels on TripAdviser. 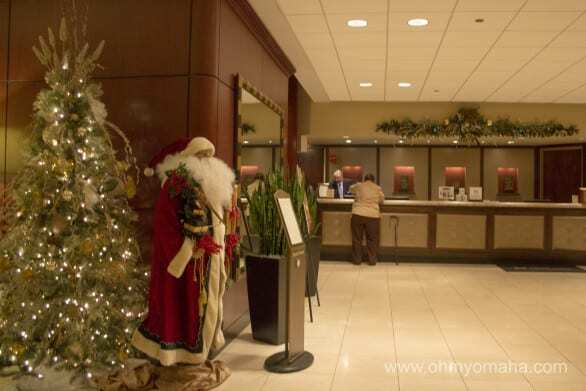 The festive lobby of the DoubleTree Hotel in Overland Park, Kansas. The Sheraton at Crown Center is totally decked out for the holidays. It’s quite a sight to walk into. Our elf, Tizbee, followed us on the trip. This will probably be his only appearance in the series of posts coming up. 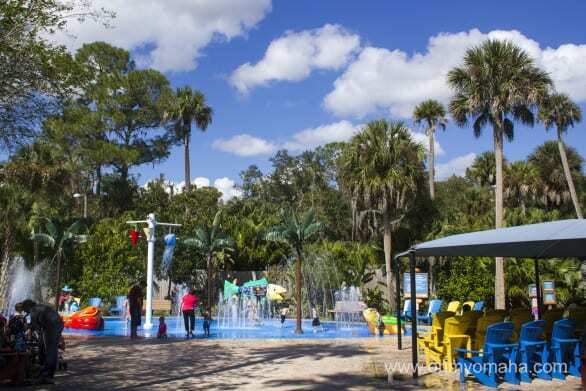 Central Florida Zoo and Botanical Gardens offers a relaxed kid-centric outing to families visiting the Orlando area. 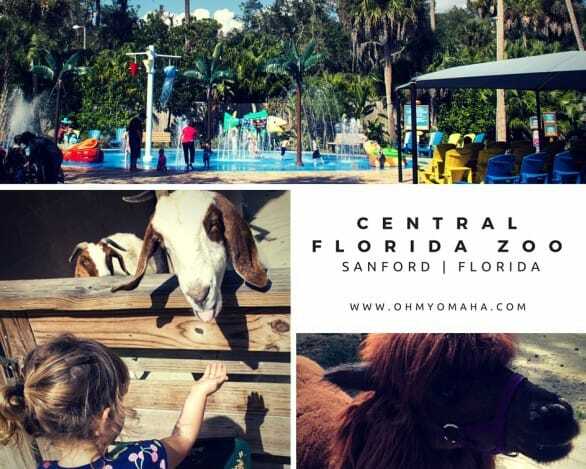 Located about 20 miles north of Orlando in Sanford, Florida, the zoo is smaller than what we’re used to in Omaha, but offers some hands-on and fun activities we don’t have. This zoo was on my Central Florida Bucket List and I was so glad to check it off! We visited during a recent weekend getaway hosted by Seminole County, Florida. As luck would have it, Allegiant just started a new direct flight to the area, so this adventure makes sense to share with you guys. This zoo is pretty close to the Orlando Sanford International Airport! By far, the runaway hit of this zoo is actually located just outside its main gates: ZOOm Air Adventure Park. UPDATE: The adventure course has a new name – Seminole Aerial Adventures. My kids and I got a chance to try out the adventure ropes and zip line courses during our visit. It was challenging but fun for all of us. 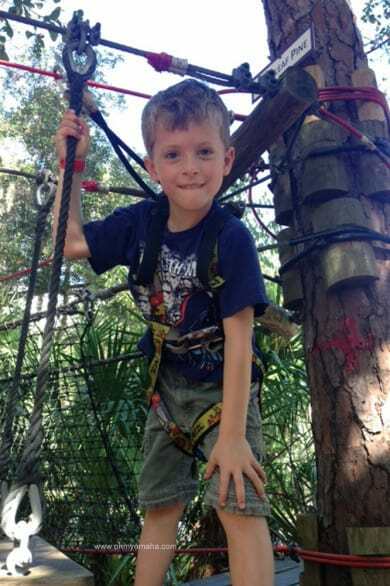 Farley conquering the kids’ zip line course in Sanford, Florida. One animal encounter at the Central Florida Zoo that we haven’t tried at our home zoo is the daily giraffe feedings. From 10 a.m. to 3 p.m., you can try to feed one of the male giraffes there (for $5 for the food). I write “try to” because when we visited, the big guys weren’t motivated to move much, least of all by the food kids were trying to offer them. They also offer Rhino Encounters on the weekends, something I think we’ll do the next time we’re visiting! The Wharton-Smith Tropical Splash Ground was a large play area right near the entrance. It would’ve been wonderful to cool off after ZOOm Air with a run through the splash ground, but I’d forgotten to bring along swimsuit. My friend, Marisa (AKA @tampamama) had warned me to always, ALWAYS pack swimsuits when visiting attractions in Florida, every place seems to have a splash ground. There’s also a children’s garden, which was less about animals and more about nature. The kids really wanted to check out the children’s garden at the zoo. 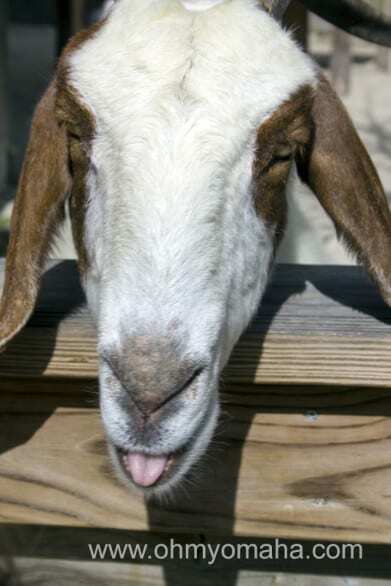 Don’t skip the cute area of the zoo dedicated to domestic animals like goats. The greediest goat we’ve ever encountered. This guy wanted all. of. the. food. 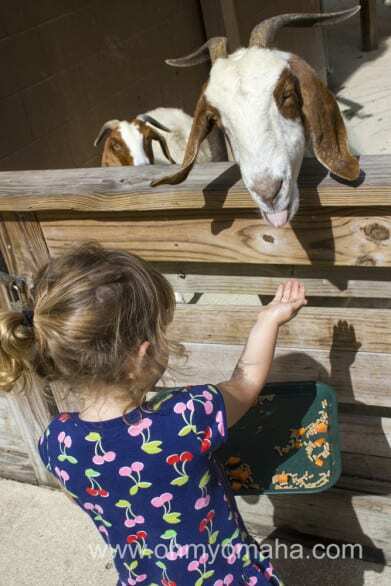 At the Barnyard Buddies Children’s Zoo, you can spend a couple dollars for a large amount of food to feed the goats, and my favorite, the llama. 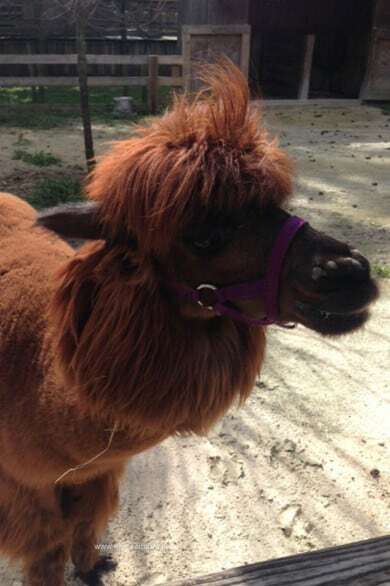 You can feed a llama, goat and alpaca at the Central Florida Zoo. Feedings at the barnyard start at 11 a.m. The goats are waiting for you. Since my kids are still pretty young, they wanted to ride the train. If you’re long-legged, I’m sorry, this ride is not going to be comfortable. The cozy little train at Central Florida Zoo. The kids loved it. It doesn’t matter where a little train goes, it’s always a big deal. Throw in a tunnel and kids lose their minds. (FYI, the train does not go through the zoo, and you’ll see no zoo animals – just cutouts). 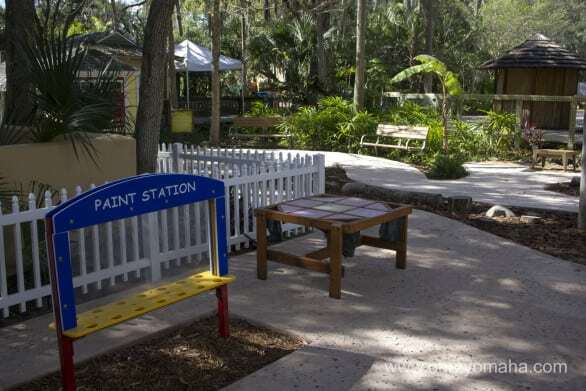 The train station is at the entrance to the Central Florida Zoo. Just try to walk past it and not have a kid ask if they could have a ride. The playground at the zoo, KaBOOM! Playground, was a big hit with my kids – it never fails… I have to tear them away from a playground wherever we go just so we can see what we actually came to see – animals! There’s also a carousel that your kids will try to talk you into, and depending on the season, other add-on activities like WOW Balls and Bungee Jump. They weren’t in operation when we visited in early November. Another seasonal offer is camel rides. Farley trying to navigate the zoo. It was a good size zoo for our kids, who were both under 6. It was small enough that we could get away with not having a wagon to cart the kids around. There were a lot of stealth animal encounters if you look for them. We found one volunteer sitting on a bench with snake. He had a lot of interesting facts for the kids. 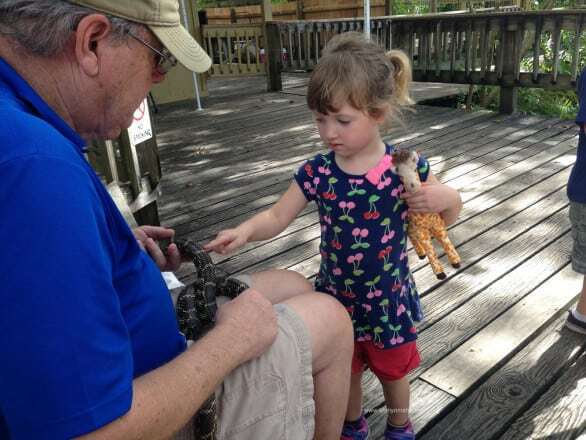 Be on the look out for animal encounters when visiting the Central Florida Zoo. The kids learned about this little snake from a friendly volunteer. We also caught the cheetah feedings on accident. Don’t ask what kind of meat they were feeding them (OK, ask, I’ll tell you). 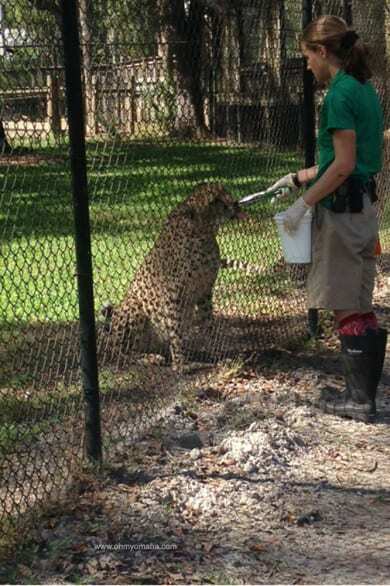 We stumbled upon the cheetah feeding time and got the insider scoop on what’s for lunch there. You don’t really want to know. With just over 200 species in the zoo, you could breeze through things in a morning. The zoo does not allow outside food, so if you are there around meal time, there are concession stands offering the typical zoo fare. 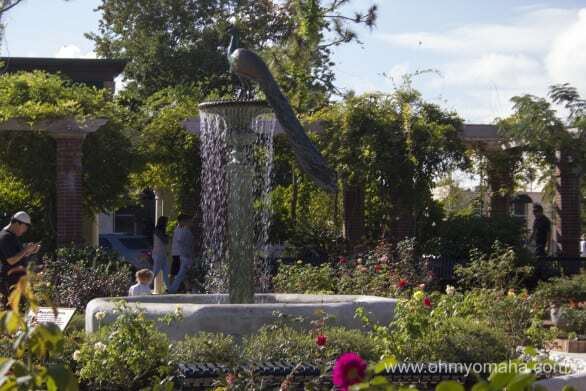 Or you can do what we did and head to the charming downtown Sanford for lunch. I recommend lunch at Hollerbach’s Willow Tree Cafe (even if you think you don’t like German food, you’ll like this German food). Another perk of visiting Florida in November – dining outside. 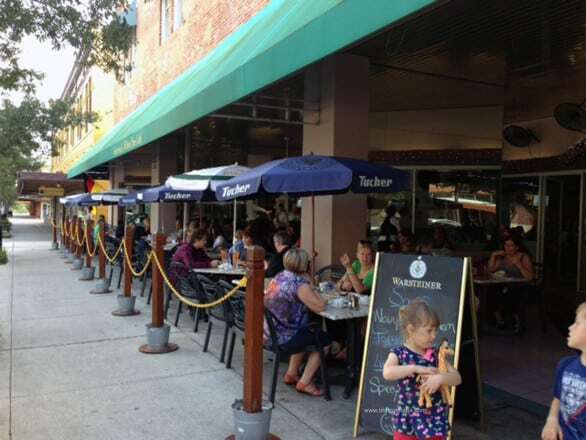 We grabbed an outdoor table to enjoy our German lunch at Hollerbach’s in Sanford. 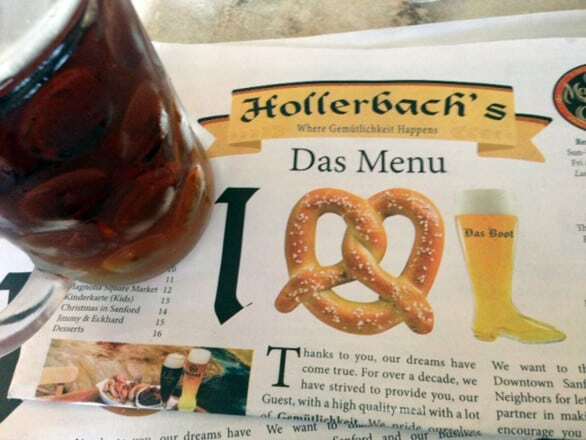 I knew I loved German beer but I didn’t think I was a fan of the food until Hollerbach’s. Everyone said I should go to this restaurant, and I’m glad we did. Prost from a great German restaurant in Florida! It was a busy place, but we were still promptly seated outside. The menu is large, the food is heavy and not exactly vegetarian friendly. I ordered off the lunch menu and got a manageable portion of wiener schnitzel with a side of Heaven & Earth Potatoes and red cabbage. 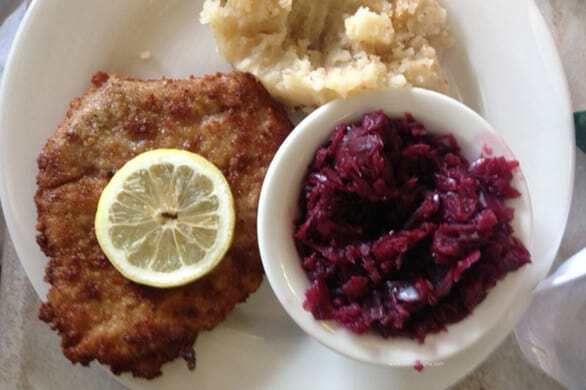 I tried the schnitzel, red cabbage and the best potato dish ever – Heaven & Earth Potatoes. Do not miss out on those potatoes. So good. 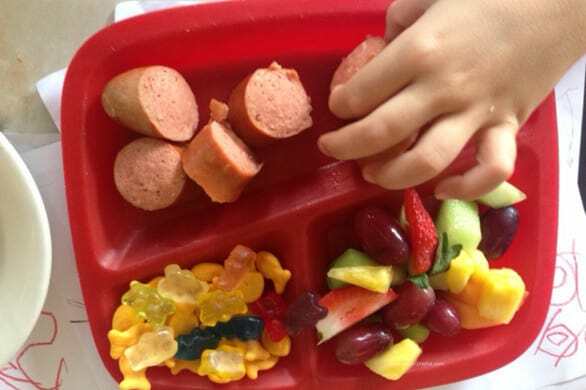 The kids each got a kinder plate of sausage. The kid’s sausage plate at Hollerbach’s in Sanford, a little bit of healthy mixed in there with the fresh fruit. The fresh fruit was a nice touch, but it couldn’t compete with gummi bears. For dessert, we split German chocolate cake. It was a huge slice, and more than enough for four people after eating a big lunch. I recommend getting the cake, but share that big boy. 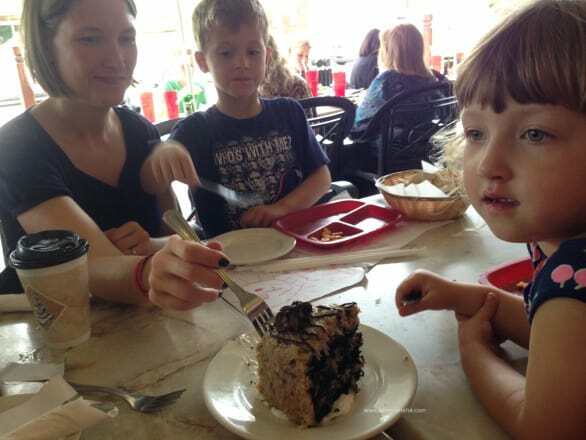 A family of four attempts to finish the German chocolate cake at Hollerbach’s (after a full lunch) and fails. Don’t skip this place. They have live music on the weekends, as well as soccer breakfasts. Where: 3755 Highway 17-92 (Exit 104 off I-4), Sanford, Fla. Cost: $19.50, adults; $15.95, seniors 60+; $13.75, children (3-12); FREE, children 2 and younger. How to get a 50% off discount: If you’re a member of your local zoo, you may qualify for 50% off admission – Omaha Zoo & Aquarium members do! Get the current list of zoos that participate here or learn more about how the reciprocity program works in this post. How much time you’ll be there: 2 to 3 hours at the zoo, longer if you eat lunch there and your kids play in the splash garden. Add at least an hour to your visit if you plan on doing ZoomAir Tree Adventure. 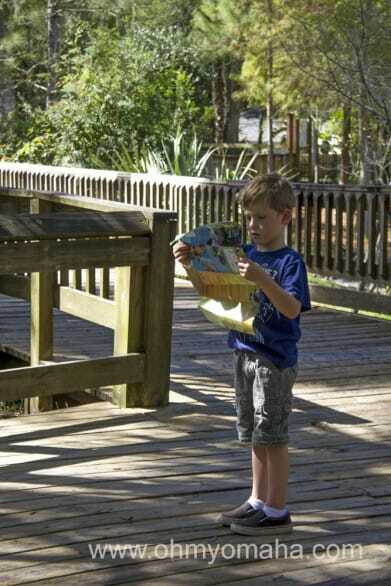 Where: 205 E. First St., Sanford, Fla.
Seminole County, Florida, asks visitors to explore the wild side of Florida, to discover Orlando’s natural oasis. Challenge accepted. 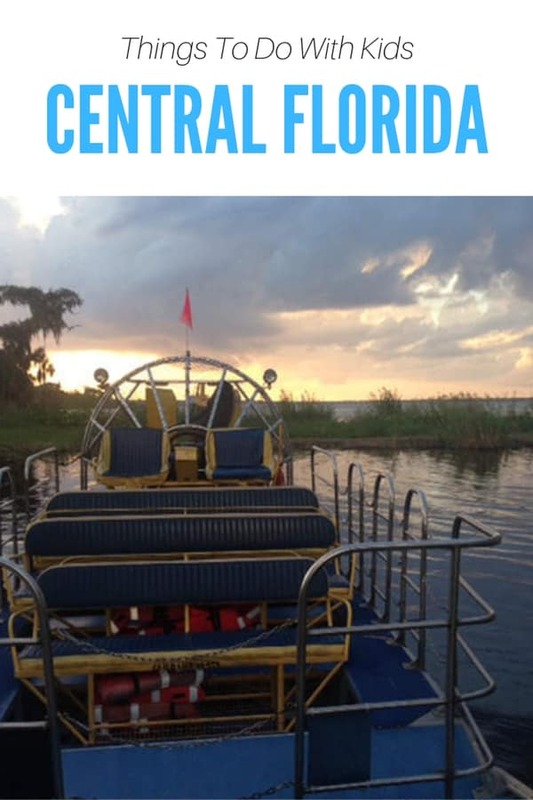 I started planning out the adventure with the help of this Central Florida Bucket List. 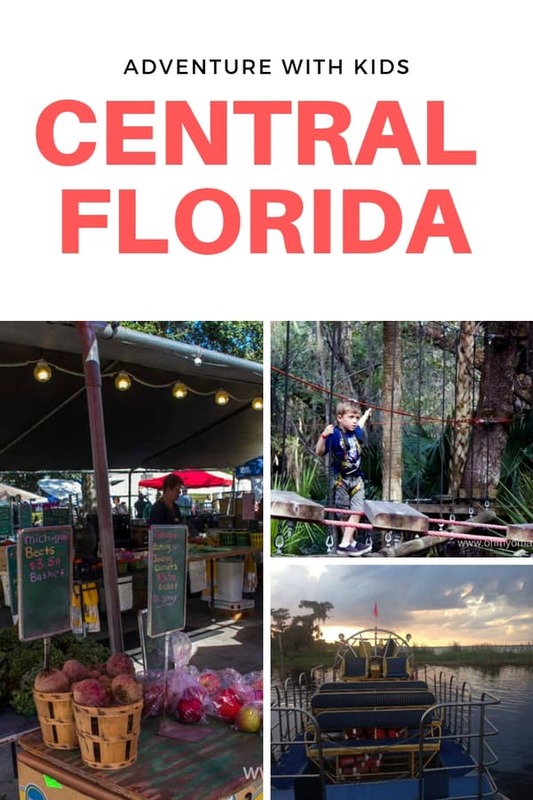 Our two-and-a-half-day trip to the north Orlando area included seeing an alligator while canoeing, zip line courses for the whole family, a sunset airboat tour and a quick trip to coast to play at Cocoa Beach. I’m writing about it because Allegiant now offers a direct flight to an airport that puts you in the middle of it all. Disclosure: This post may contain affiliate links. At no additional cost to you, I receive a small payment if you purchase something after clicking the referral link. 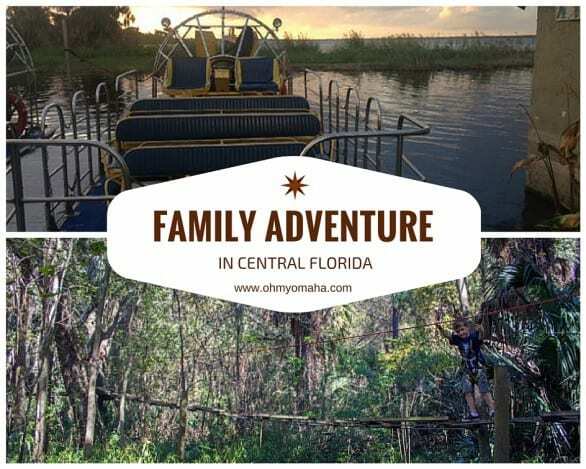 Our trip was hosted by Seminole County, and knowing my family wanted adventures both on water and land, they suggested a centrally-located hotel that was affordable (and near theme parks, should we choose to visit…er, next time, kids). We stayed at the Hilton-Altamonte Springs, a beautiful hotel near familiar chains and close to the interstate we’d use to get everywhere – I-4. I’ll share more about the hotel in a future post, but for traveling families – yes, there’s an outdoor pool (the only hotel amenity important to my kids). It’s approximately 20 miles from Orlando Sanford International Airport, which is a direct flight from Omaha on Allegiant. Check out my post on what to expect when flying this route – I include helpful tips for making it a smooth experience with kids! 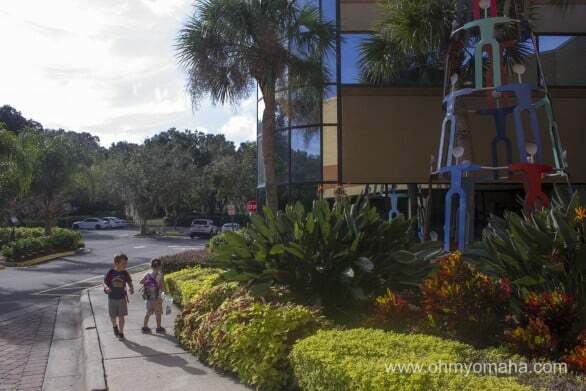 Search for the most family-friendly hotels near Orlando on TripAdvisor! On our first day, we headed to the Central Florida Zoo in Sanford. 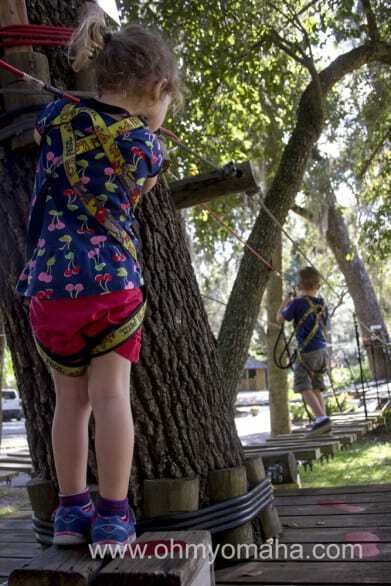 ZOOMAIR Treetop Adventure Park Orlando (now called Seminole Aerial Adventures) is located at the zoo (since this post was published, the zip line course has changed its name to Seminole Adventures. Our plan was to try the ropes and zip line course first, then go to the zoo. While the kids tackled their age-appropriate course with the help of the wonderful Maggie from ZOOMAIR and Mr. Wonderful , I tried out the more challenging course. It was not too easy, but also manageable for any first-timer. Mooch kept up with her big brother on the zip line course. Mooch had a harder time, being only 4, but was proud of herself for finishing. Expect at least an hour for the kids to get through their ropes course. If you do a course, you can get through the first one in 45 minutes, and if you add on the rain forest course, you’ll double that, at least. After our zip line adventure, we checked out the zoo. 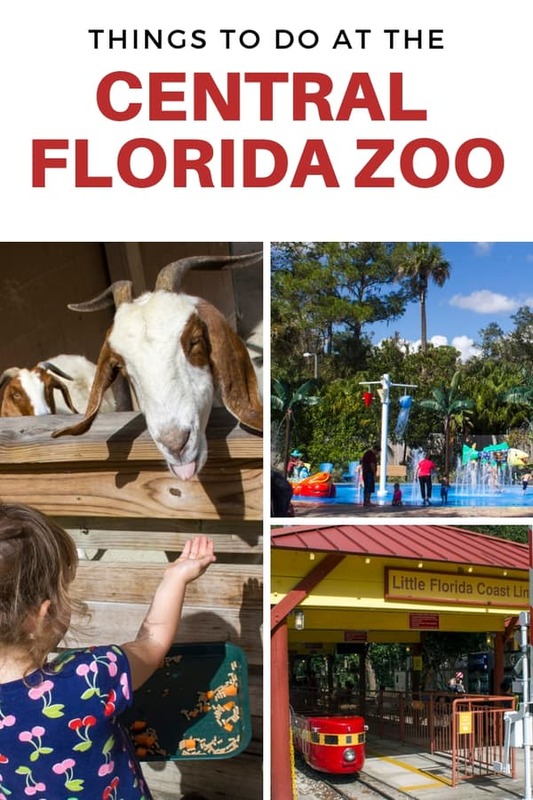 This small zoo covers about 116 acres and is great for little ones. Bring a swimsuit so kids can cool off at the splash garden (which will be refreshing after the adventure on the zip lines). I forgot and was reminded repeatedly. There are hands-on experiences there that kids will like – mostly feeding animals and enrichment encounters. There are extras like a carousel and train ride, as well. After our zoo and zip line adventure, we headed to charming downtown Sanford to have lunch at Hollerbach’s Willow Tree Café. Another perk of visiting Florida in November – dining outside. We grabbed an outdoor table to enjoy our German lunch at Hollerbach’s Willow Tree Cafe in Sanford. The German food was so good, and the beer was even better. If you manage to save a little room, try the German chocolate cake there – we split it between the four of us and couldn’t finish it. Our second day was going to be all about water. But first, breakfast. One of the fountains in the park at Winter Park. We made the short drive to Winter Park to grab some pastries at Croissant Gourmet – which we enjoyed in the cute park before strolling through the farmers market. 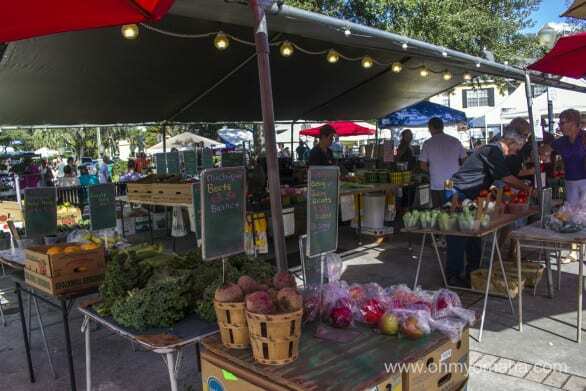 Exploring Winter Park’s Saturday Farmers Market. So many goodies to find there! Breakfast Part II was a breakfast quesadilla from a the Tastebuds food truck at the Winter Park Farmers Market, and citrus fruit samples. 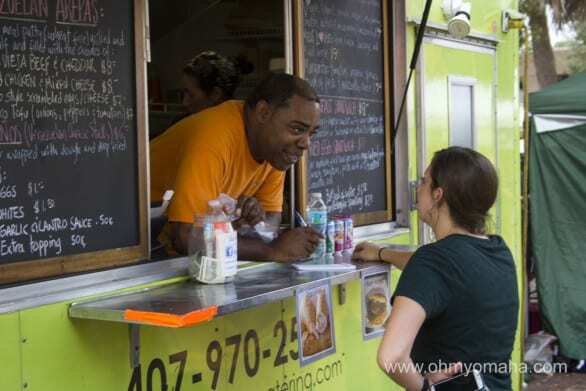 We got some breakfast quesadillas to go from Tastebuds food truck at the Winter Park Farmers Market. It’s fun to check out farmers markets when traveling – we don’t have avocados or oranges at the Omaha ones. We met friends at Cocoa Beach at around noon – the drive was about an hour (beware of the tolls). I don’t regret the drive – the kids could’ve played in the water all day. 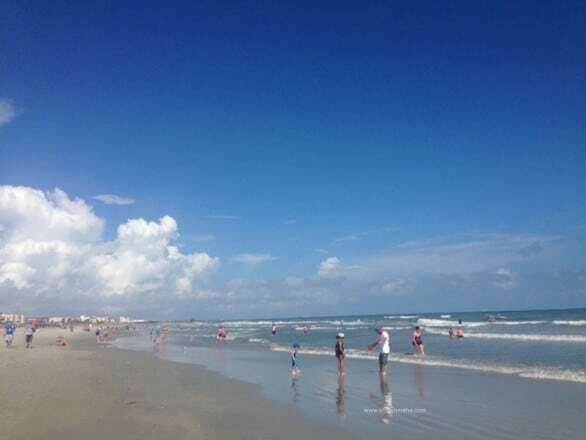 Cocoa Beach is about an hour drive from Seminole County, Florida. Little tip from my Florida friends: Shephard’s Park is a convenient spot to park at Cocoa Beach but also the most expensive ($15). Found that out the hard way. Go toward the Cocoa Beach Pier for meter parking or head farther south for cheaper or free parking at city and county park entrances to the beach. The good thing about the location is that there is a place to change, bathrooms, a shower to rinse off and a lifeguard. 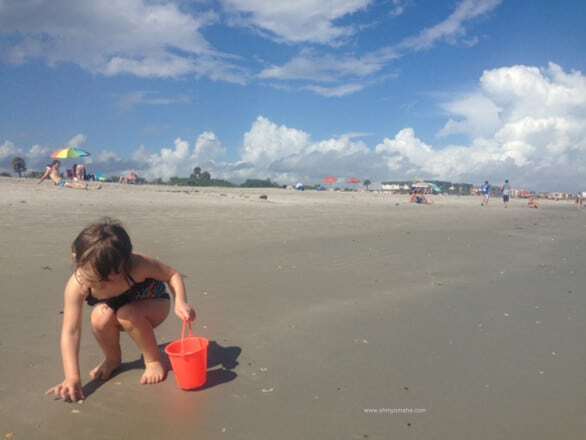 Collecting seashells at Cocoa Beach, Florida. We didn’t pack a lunch for our time at Shephard’s Park, so our friends suggested we try the Cuban sandwiches at Seven Eleven across the street. Don’t knock it ‘til you try them. They hit the spot. 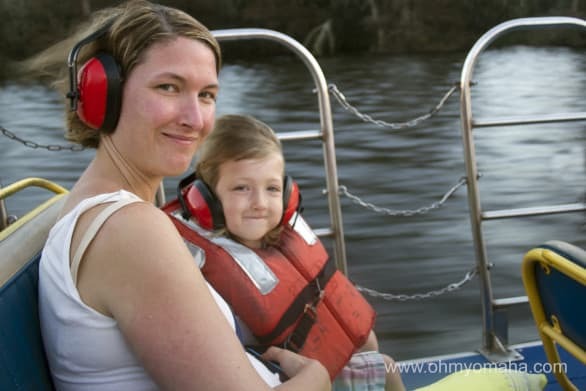 After the beach, the kids were surprisingly still awake so we decided to check off an item off my Florida bucket list – an airboat ride. Black Hammock had some beautiful views – and we hadn’t even gotten on the airboat yet. We arrived at Black Hammock in time for their final 30-minute tour of the day, timing it perfectly to catch a gorgeous sunset. The kids loved the ride (so did the adults). 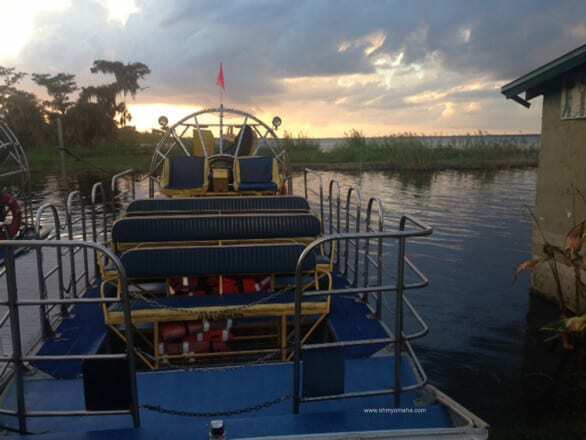 Enjoy some wind in our hair during our sunset airboat ride with Black Hammock in Seminole County, Florida. Unfortunately, our boat got stuck after stopping to look at cows. So what would’ve been a lovely sunset ride ended in darkness. Our funny captain swore it’s only happened to him two other times in all his rides. 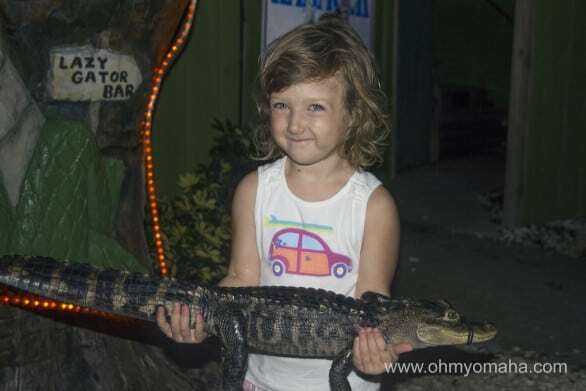 The kids forgot about it after they each got to hold a baby alligator afterward. Black Hammock also has a few cages to see alligators and parrots, and an awesome tiki bar. There’s a restaurant on site serving up gator. 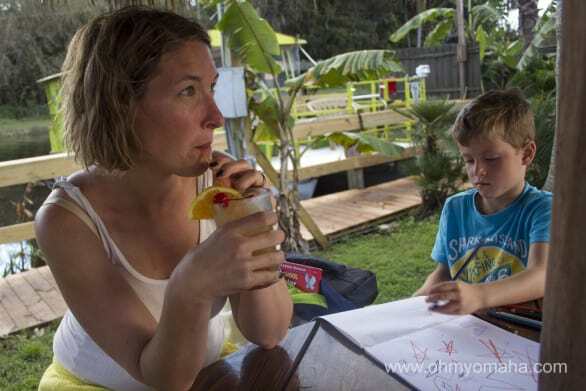 Get to Black Hammock early and enjoy a little rum drink from the tiki bar. The kids tried the gator bites with Cajun flavor and loved them. We ended our late night with some ice cream and gelatti at Jeremiah’s – a frozen treat chain offering ice cream and Italian ice, and the combo of laying ice cream and Italian ice called gelatti. Canoeing toward Wekiwa Springs State Park. Adventures on our water carried over to our last day. 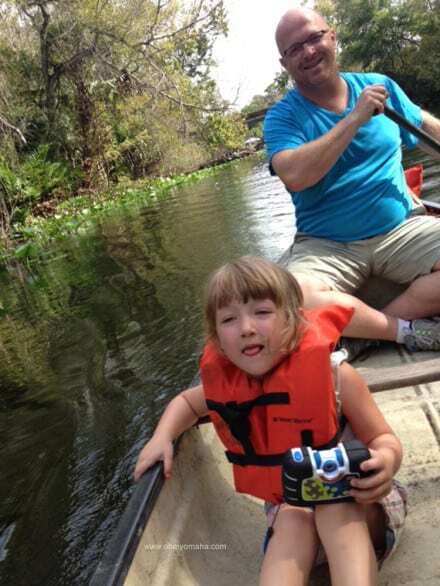 We went to Wekiva Island to rent a canoe so we could paddle roughly one mile to Wekiwa Springs State Park. The route was gorgeous and not challenging if you’re familiar with paddling. 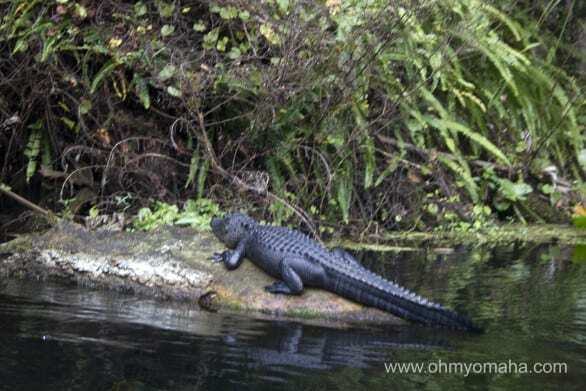 You’ll spot lots of birds along the way, and with luck, other wildlife like an alligator. We caught this alligator sunning himself as we paddled by. You can paddle about 30 minutes to Wekiva Springs or take a four-hour round trip to Rock Springs. We were short on time and went to Wekiva where sadly, we only got to pause and watch others swim. We’ll definitely return to take a dip. 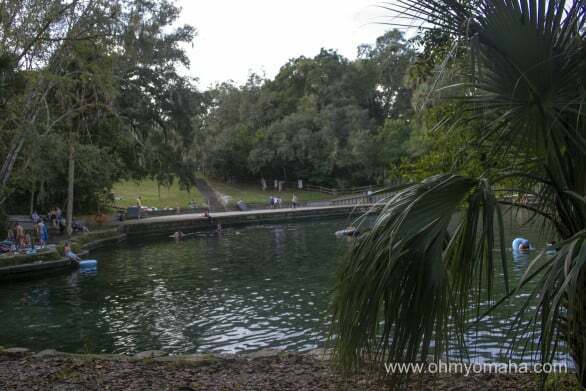 There were quite a few people swimming in the spring water at Wekiva Springs State Park. Entrance is $2 per canoe. We finished canoeing in time to grab lunch on the run, fill up our rental car and head for the airport to fly home. Yes, we were a stinky mess on the plane. – Breakfast: During our trip, we had breakfast at the Hilton Altamonte Springs (a buffet that’s complimentary for Hilton Honors members), pastries at Croissant Gourmet in Winter Park (try the pain au chocolat), hearty breakfast quesadillas at the Tastebuds food truck at the Winter Park Farmers Market, and a filling breakfast at Keke’s Breakfast Café (there are several locations; we went to the Altamonte location on the way to Wekiva Island). – Lunch: We enjoyed lunch outdoors at Hollerbach’s Willow Tree Café in Sanford. The other lunches were on the go, courtesy McDonalds (hey, we were running late to the airport after canoeing), and Seven Eleven (you do what you gotta do at the beach). – Dinner: We enjoyed take out pizza from Anthony’s Coal Fired Pizza in Altamonte Springs and it was delicious. We also tried several variations of alligator during dinner at Black Hammock Restaurant in Oviedo. 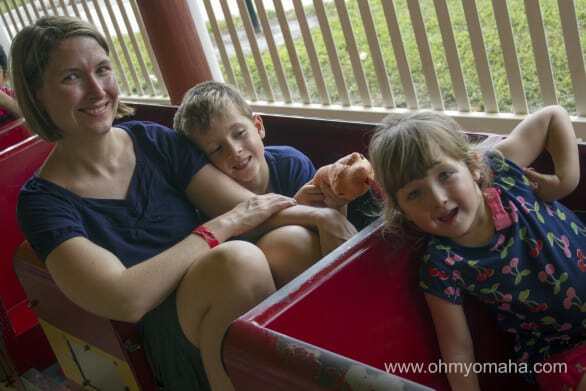 – Snacks: Our visit to the Central Florida Zoo involved some snacking at one of the concession stands (usual fare, Dip ‘n Dots, chips, etc), kettle caramel corn from the Winter Park Farmers Market, and ice cream and gelatti at Jeremiah’s. Weekend getaways are nice, and sometimes, much needed. All you need is an hour in the car and you’ve escaped. Even overnights can provide a much-needed breather from reality and routine. Want to get away for a little bit this holiday season? Check out what’s going on in some nearby cities (Grinches may want to look elsewhere)! When: Nov. 28, 6 to 8 p.m.
Where: SouthPointe Pavilions, 2910 Pine Lake Road, Lincoln, Neb. What: Join Santa as he makes his grand entrance with a cast of holiday characters including live reindeer. There will be music, activities, performers, refreshments and giveaways, too. When: Dec. 3-6 and Dec. 10-13, Thursday-Saturday at 7:30 p.m. and Sunday at 2 p.m.
Where: NWU McDonald Theatre, Huntington Avenue, Lincoln, Neb. What: NWU Theatre’s Christmas tradition continues in 2015 with miserly Scrooge, a trio of frightening and enlightening ghosts and a whole lot of good cheer. This event is at NWU McDonald Theatre. When: Dec. 4, 5 to 8 p.m.
Where: Lincoln Children’s Museum, 1420 P St., Lincoln, Neb. What: It’s a night of song, dance, storytelling, indoor snowball fights, decoration making and special guest appearances, including Santa, who opens the world’s most famous toy shop right in the Discovery Gallery. For more information call (402) 477-4000 or visit here. www.lincolnchildrensmuseum.org. When: Saturdays, Dec. 5, 12 and 19, 10 a.m., 11 a.m., 1 p.m., 2 p.m., and 3 p.m.; Sundays, Dec. 6, 13 and 20, 1 p.m., 2 p.m. and 3 p.m.; and Thursdays, Dec. 10 and 17, 10 a.m., 5 p.m. and 6 p.m.
Where: The Lincoln Children’s Museum, 1420 P St., Lincoln, Neb. What: The Lincoln Children’s Museum will supply the 15-inch house frame, frosting and a variety of candies and decorations, and all you have to do is bring the fun. For more information, call (402) 477-4000 or visit www.lincolnchildrensmuseum.org. Santa at the Lincoln Children’s Zoo’s North Pole Express. When: Dec. 5, 6, 12 and 13, 11 a.m. to 3 p.m.
Where: Lincoln Children’s Zoo, 1222 S. 27th St., Lincoln, Neb. 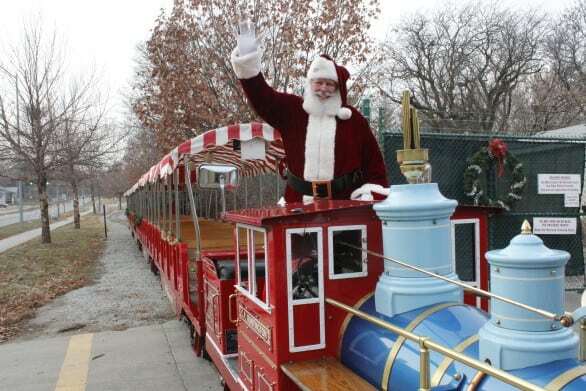 What: The North Pole Express is Lincoln’s only train offering services to Santa’s Village! After departing the train, your travels will take you through Candy Cane Lane where you’ll stop at The Hive to write your official letter to Santa and see some of his favorite animal friends. Continue down Candy Cane Lane to meet the Big Man himself! After visiting Santa, enjoy treats made by the Elves, hot chocolate and candy canes. Be careful not to fill up on candy canes because your next stop is the Mrs. Claus Bakery to decorate your very own cookie! All activities are indoors. When: Dec. 6, 1 to 5 p.m.
Where: Thomas Kennard House, 1627 H St., Lincoln, Neb. What: Dedicated as the Nebraska Statehood Memorial in 1968, the Kennard House is the oldest standing structure in Lincoln’s original plat. This 1869 italianate structure is home to Nebraska’s first Secretary of State, Thomas P. Kennard. The house will be decorated for a Victorian Christmas complete with a tree, candles, toys, presents, and decorative greens. Where: State Capitol Rotunda, 1445 K St., Lincoln, Neb. What: The 67th annual Nebraska State Tree Lighting happens in the Rotunda of the State Capitol. In 1942 the Women’s Division of the Chamber of Commerce and the Ministerial Association held the first carol sing on the steps of the Capitol for the servicemen stationed at the Lincoln Air Base. When: Dec. 11 and 18, 6 to 9 p.m.
What: Featuring free horse and carriage rides, entertainment at Seventh and P Street, and Santa strolling the area. When: Dec. 12, 8 a.m. to 6 p.m.
What: The day starts with Breakfast With Santa from 8 to 11 a.m. in the lower level of the candy factory Eighth and P Street. Starting at 10 a.m., many Haymarket business will offer special sales. 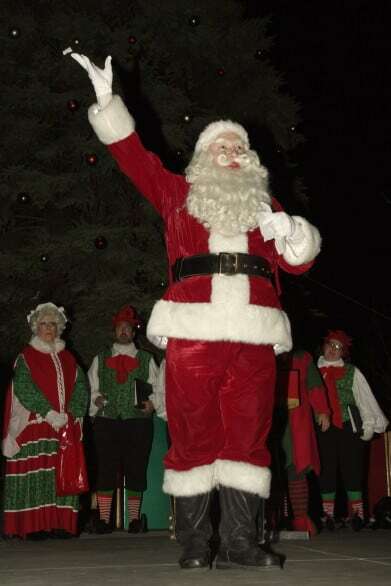 There will be entertainment throughout the area, strolling Santa, and other events to be announced at a later date. When: Dec. 13, 7 p.m.
Where: First Methodist Church, 2723 N. 50th St., Lincoln, Neb. What: Seasonal favorites will be played during this concert. When: Dec. 31, 6 p.m.
What: For nearly 20 years, families have celebrated New Year’s Eve at Make Believe Midnight. Guests wave goodbye to Father Time before welcoming Baby New Year and watching the ball drop at 8 p.m. This Lincoln tradition is known for its bubble wrap stomp, dance party, fun party favors and, the most exciting, balloon drop. This year’s event will be even more exciting with the popular balloon drop happening over Cuckoo Construction, the museum’s new, largest exhibit that opens this month. No visit is complete without some good eats! For a nice cup of coffee/or cocoa for the little ones visit The Mill in Lincoln’s Historic Haymarket (800 P St.). When: Dec. 6, starting at 4 p.m.
What: The activities will start off with a visit from Santa at the library. The Friends of the Library will host their annual soup dinner in the meeting room at the library starting at 4 p.m. The Living Nativity will be held in front of the Christmas Tree on Main Street starting at 5 p.m. Upon the conclusion of the Living Nativity, the Christmas Tree will be lit. Luther Memorial Luther League will selling hot cocoa and cookies starting at 3 p.m until after the tree lighting. 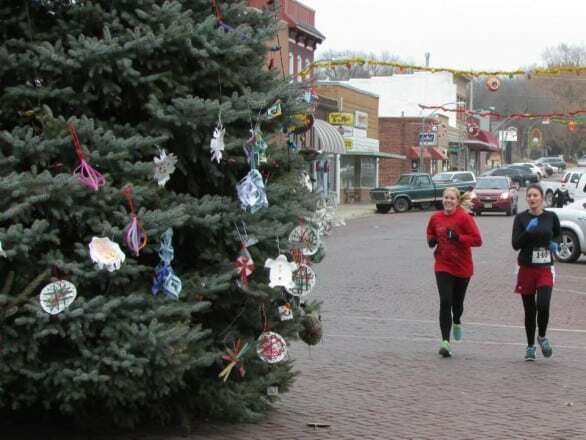 Several downtown businesses will be open for extra Christmas shopping from 3 to 7 p.m. The Beer Stein will hold a wine tasting after the tree lighting. When: Nov. 26, 11 a.m. to 2:30 p.m.
Where: Lied Lodge & Conference Center, Timber Dining Room, 2700 Sylvan Road, Nebraska City, Neb. What: A delectable buffet dinner in beautifully inspiring surroundings. When: Fridays and Saturdays in December (Dec. 4, 5, 11, 12, 18, 19, 25 and 26), 7 p.m.
Where: Starting from Lied Lodge & Conference Center, 2700 Sylvan Road, Nebraska City, Neb. Where: Whispering Pines B&B, 2018 Sixth Ave., Nebraska City, Neb. 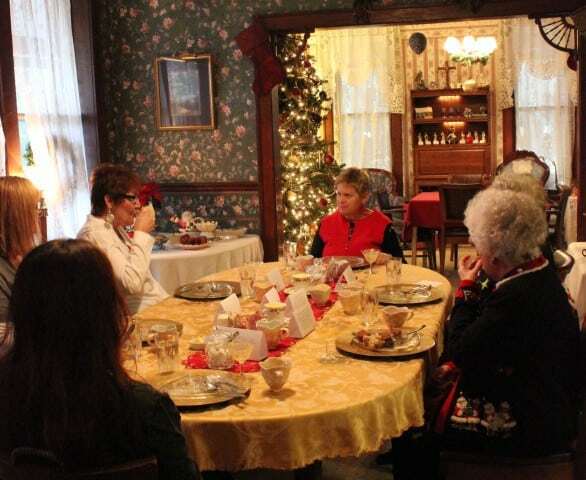 What: Invoke your holiday spirit with tea at Whispering Pines B&B in the glow of festive decor. Bring your appetite and indulge in tasty cakes, dainty sandwiches, and assorted sweets served with a variety of exquisite teas in old fashioned tea cups. Cost: $20, adults; $10, children younger than 12 (includes unlimited tea and delectable treats). Receive a $5 off discount if you book an overnight stay. Where: Arbor Day Farm Tree Adventure, 2611 Arbor Ave., Nebraska City, Neb. What: Get into the holiday spirit with fun traditions and activities including: Free hot apple cider while you shop and hike the trails; make-and-take ornaments from 11 a.m. to 3 p.m.; and scavenger hunt for Santa’s wooden reindeer along the trails (all day, on-your-own activity). Where: Lied Lodge & Conference Center, 2700 Sylvan Road, Nebraska City, Neb. What: Special children’s buffet during Sunday Brunch. Visit Santa in front in the fireplace of the lobby of Lied Lodge. Where: Wildwood Historic Center, 420 Steinhart Park Road, Nebraska City, Neb. What: Enjoy holiday music played by Angie Madison on the 1883 Steinway Parlor Grand piano as you stroll through Wildwood House all decked out for a Victorian Christmas—just as families would have done in the past. Refreshments will be served in the Barn among displays of vintage china set up just as elaborately as in the 1800s. When: Saturdays, Nov. 21 through Dec. 19, 6:30 to 8 p.m.
Where: Arbor Lodge at Arbor Lodge State Historical Park, 2600 Arbor Avenue, Nebraska City, Neb. What: Tour the home of J. Sterling Morton, founder of Arbor Day, decorated for Christmas. Light refreshments and music in the mansion. Here are some restaurants recommended to me for visiting people over the holidays: Timber Dining Room at Lied Lodge, El Portal Mexican and Valentino’s. 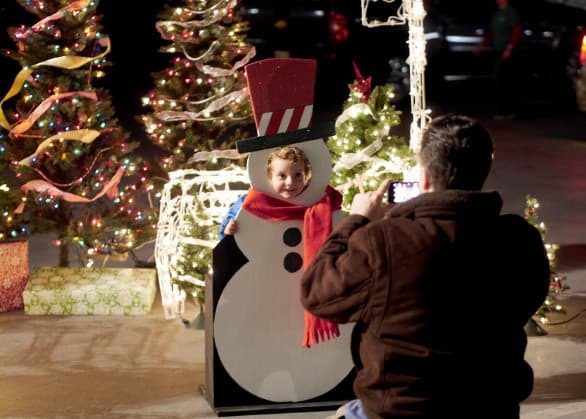 Know of more holiday events in Lincoln, Syracuse, Nebraska City or another nearby town? Please send me your recommendations and I’ll add them to the list. 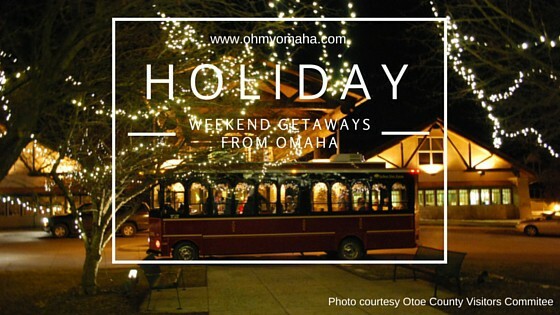 Email ohmyomaha (at) gmail (dot) com! Thank you!